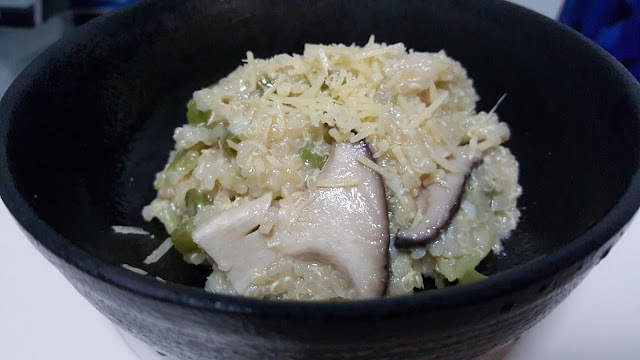 Nana Patricia | ♥Where ideas come to life♥: Thermomix Quinoa Risotto Recipe! Quinoa (/ˈkiːnoʊ.ə/, from Quechua kinwa or kinuwa ) is a species of the goosefoot genus, a grain cropgrown primarily for its edible seeds. It is a pseudocereal, similar in some respects to buckwheat, rather than a true cereal, as it is not a member of the true grass family. in short .. Quinoa is a super food! arh .. well , i've never been to Italy , and i wish myself will have a chance to visit this lovely country and enjoy the real Italian dishes one day in future huh! i'm pretty love pizza , pasta , and... Risotto ! So .... today i'm going to combine both of my favourite dishes into one dish ! And , ready to serve! Click the video below for my short cooking lesson!